The upcoming fourth-gen Toyota Prius does not have an official arrival date just yet. In fact, we’re not sure if it’ll be a 2016 or 2017 model year vehicle when it does finally arrive. Still, based on the amount of development mules we’ve seen around the world recently, the Japanese automaker must be hard at work to get the next version of the world’s best-selling hybrid ready for its legions of fans. A new set of spy shots gives us our first view of the refreshed interior in the new Prius. These photos represent the best look of the new Prius that we’ve seen yet, both inside and out. We’ve see the heavily cladded exterior a few times now, and these new shots don’t add too much to what we know about that. This time, though, we can see that Toyota has revamped the inside in a pretty big way from the third-gen. Previously, we saw a bare-bones prototype interior but these new pictures show off a sleek new infotainment screen with HVAC control buttons along its bottom. The Prius’ traditional high-mounted driver information cluster remains, this time fully centered, keeping the area above the steering wheel clean and uncluttered. Long-time Prius fans will notice that there’s still a cute little outline of the car to show you where the propulsion energy is coming from as you drive down the road – and to give you a hint of what the car actually looks like. The Prius’ traditional little shifter knob is also still there, this time located right around the driver’s right knee area. The new Prius will use Toyota’s new TGNA platform and the only official word we’ve heard about how efficient it will be is that it’ll get higher fuel economy than the current one (which gets 50 miles per gallon, combined). That’s not all that helpful, but that’s what Toyota North American CEO Jim Lentz said. 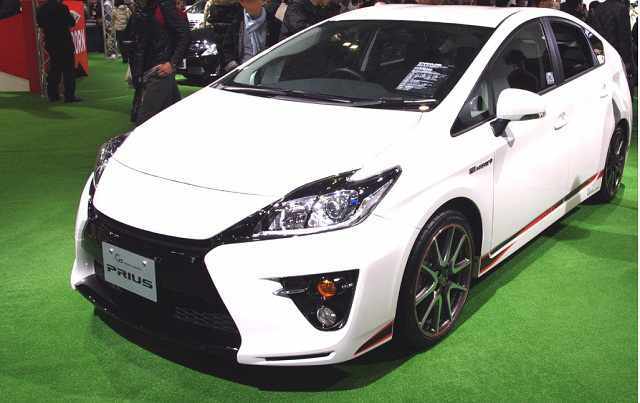 Unofficially, we’ve heard that the new Prius will get around 55 mpg.